Equipped with 1080P HD camera with controller 4.3 inch LCD screen. Hubsan X4 Brushless FPV real time 5.8GHz transmitter and 2.4GHz receiver . Function : GPS ,headless mode ,automatic return ,altitude mode ,follow me function . 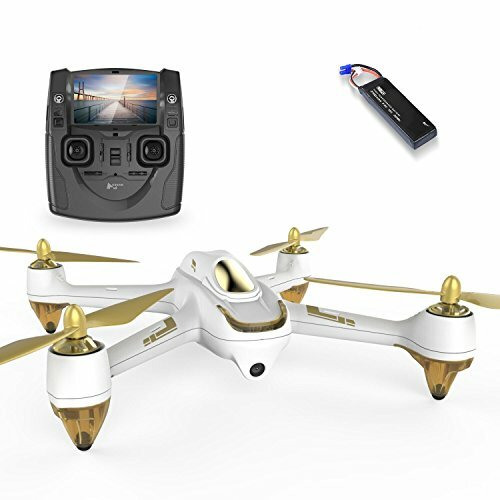 The Hubsan H501S X4 is an easy to use and feature-rich drone with an attractive price tag. The built-in GPS positioning feature and follow-me mode make this a great way to take pictures of your out-door vacation. The Hubsan H501S is a real-time FPV drone, the viewer on the ground control station show what it would look like if you were in the cockpit of the aircraft. It is priced right for someone moving up from beginner to intermediate class pilot. Battery 7.4 v 2700mAh Lipo battery gives you about 20 minutes of flight time. Flight controller has follow-me node and headless mode. Built in GPS assists in hovering and the Return to Home functions. Auto Return to home means it will return to starting point if it loses signal. One button RTH (Return to Home). Follow-me mode is a great way to show your friends what you are doing on vacation. Altitude hold gives the ability to stop the quadcopter, but not land it. 4 channel transmitter allows the pilot to control multiple quadcopter functions at the same time. Overall this Hubsan H501S X4 quadcopter has the right features for someone moving up from beginner class pilot to intermediate class pilot. Take it along to events and get great videos to show your friends what is going on. This Hubsan H501S X4 GPS 4 Channel drone (View on Amazon) is easy to use with great standard controls such as the automatic RTH, altitude hold, follow me and GPS positioning. It has premium features such as the durable brushless motors and excellent flight time of 20 minutes. Nice price for someone moving up from beginners to intermediate class pilot. The Hubsan H501S X4 Professional drone is almost exactly the same as the Hubsan H501S X4 GPS 4. The only difference is in the Ground controller. The Pro ground controller uses a LiPO rechargeable battery while this model is smaller and uses AA batteries.